Young's pub in Kentish Town, alongside the Kentish Town Forum. 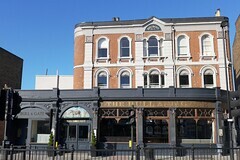 Before its acquisition by Young's, it was also a live music venue (see previous version of this page for details); however, according to the Aug/Sep 2015 London Drinker this is no longer the case. Last visited by Ewan and friends, October 2008. Last edited 2015-08-11 08:28:23 (version 8; diff). List all versions. Page last edited 2015-08-11 08:28:23 (version 8).